The demand for web developers is growing, and programming skills are increasingly valued for a variety of business initiatives. 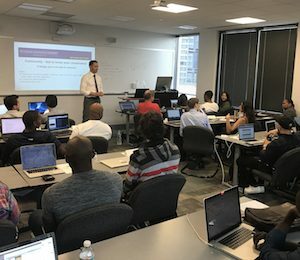 The GW Coding Boot Camp Full Stack Flex Web Development course teaches the fundamental skills that can help guide you down a new path for success in an exciting field. If you want to learn how to create websites and applications, are considering a career in web development, or you want to add or improve upon your technical skills set, it’s time to take a look at a program that can help guide and support you every step of the way. Collaborate with peers on group projects, just like you will in a real web development position. Get first-hand experience in learning opportunities with employers. Practice the skills learned each week to complete assignments and projects, as you build a diverse portfolio that demonstrates your skills to future employers. Receive a non-credit professional certificate from the GW College of Professional Studies as validation of your knowledge. Access numerous career-planning services like resume and social media support, portfolio reviews, technical interview practice, soft skills training, and even recruiting help to prepare you for the job market. You’ll receive a challenging but highly rewarding educational experience whether you choose our 24-week, part-time program or our 12-week, immersive program. Through in-person instruction and peer collaboration, you’ll gain a firm grasp of the theories behind web development and proficiency in the application of its concepts. This program is right for anyone who is technologically curious, ready for a career change or advancement, and above all—eager to learn. 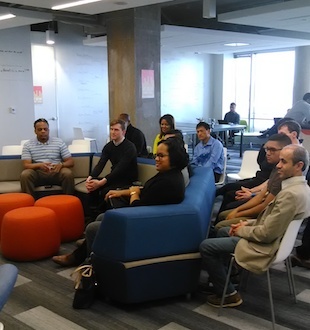 If you’re ready to learn more about GW Coding Boot Camp, contact an admissions advisor at (202) 629-0252.